NASA announced last week that they have selected the upper stage of the Delta IV launch vehicle for the second stage of the first Orion launches. This upper stage will be lifted by the (currently non-existent) Space Launch System first stage, which is supposed to have three modified Shuttle Main Engines and either solid or liquid-fueled strap-on boosters. The Orion, or more boringly named the Multi-Purpose Crew Vehicle, is being built by Lockheed – Martin. Boeing builds the Delta IV upper stage with a Pratt & Whitney RL-10 engine and burns LOX and liquid hydrogen. The first flight of Delta IV was in 2006. I would expect that eventually Boeing will be named prime contractor for the first stage of the SLS as well. NASA institutionally believes that playing around with low-orbit launch vehicles by upstart little companies is all well and good, but when we get to the heavy-duty stuff we go with the proven big guys. Or maybe it’s when we get to spending real money? I’m cynical, I know. And I really don’t have anything against Boeing. In fact, I’m chuckling today because the “Occupy Chicago” movement folks that were supposed to knock Boeing back on its heels today with the big demonstration actually had…a sort of little demonstration. Hundreds, not thousands. I personally believe the demonstration today has far less to do with Boeing’s involvement in building military aircraft than it does with the fact that Boeing built a non-union plant in South Carolina, not bowing to Obama Administration pressure. The second stage only generates about 25,000 pounds of thrust but can burn for over 1000 seconds. It’s a more powerful second stage than the one Astrium is going to build for the ATK Liberty launcher. At the moment, Boeing’s launch vehicles are the only game in town with that level of performance. Build the Enterprise – in 20 years, for cheap! I’m not going on a rant about how we spend billions each year on stuff not nearly so awe-inspiring, or any of that. I just wanted folks to see what Dan was doing. He has a somewhat unique vision, I think: would it be more inspiring to build a spaceship that could travel throughout our solar system if we named it “Enterprise” and made it look like a TV spaceship from 50 years ago? How would you do it? While his Enterprise is not warp-capable – he’s basing it completely on technology already in place or in development today – he may have a point. I remember the elation in the “Trek community” when the first Shuttle to be rolled out was named Enterprise. Then we found out that it would never go into space – that it was a “test article.” We watched it fly around on the back of a 747 and do some glide tests, but I know many of us felt our dream had been crushed again – held out, then snatched away by realists at NASA. The name Enterprise has a history unique in our culture. Of course Gene named his after the aircraft carrier, the first nuclear carrier in the world. 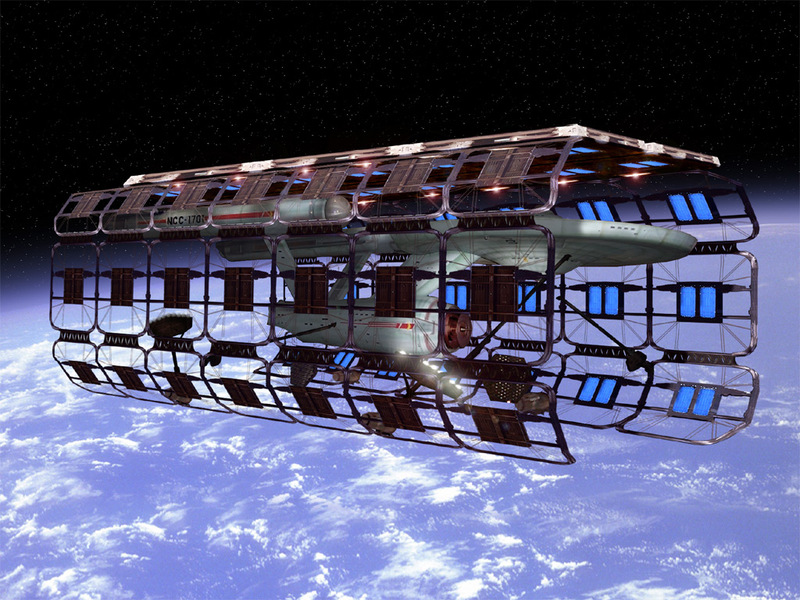 By the time “The Next Generation” rolled around, rather than trying to use a different name, it was updated but called the Enterprise-D; the continuity of the name was deemed important. And I think Dan is right: the ability to build an “Enterprise-like” spaceship is now technically within our reach. Getting to orbit is getting easier, and over the next three or four years it should get easier still. By the time components need to be put in orbit – and that’s where you build it, J.J. Abrams, not on the ground! – access to orbit will be easier and more reliable, and somewhat less expensive. Such a program might even encourage the commercial space access companies to move faster. Part of the reason they aren’t moving faster now is that the market is too small and too variable. Does any other company have a backlog of 20 missions or more, like SpaceX? So read through Dan’s pages. I would love to think this would be the start of something really big! You are currently browsing the The Old Gray Cat blog archives for the day Monday, May 21st, 2012.